Anchors Away! 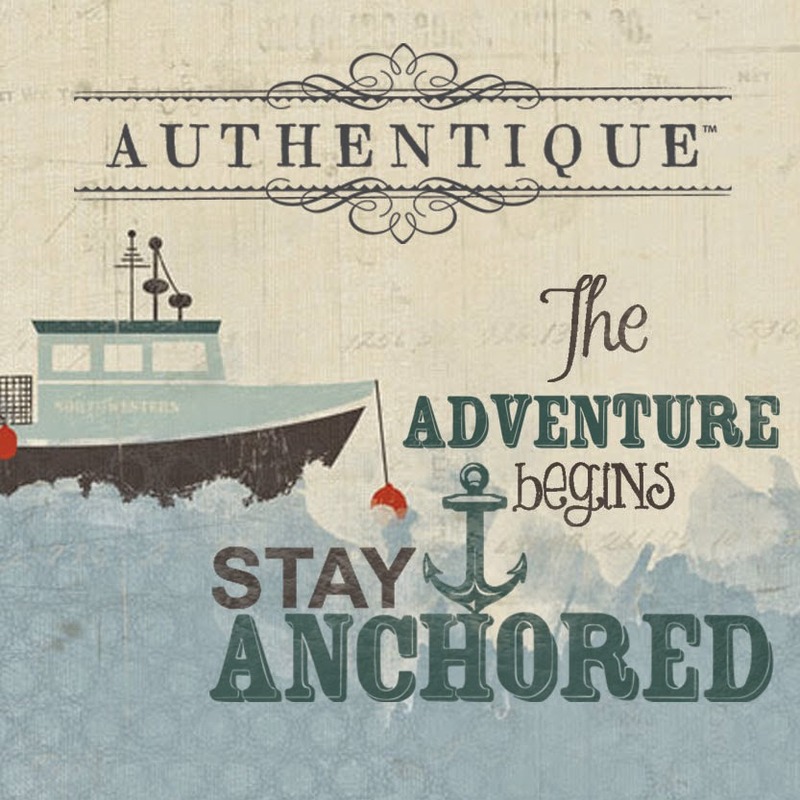 with Authentique Paper & Petaloo! and several finds from Petaloo! There are a few different recipes online for making these; I've created my own to represent the size I was looking for. To begin, cut desired double-sided patterned paper to 7"X12". With the paper laying length wise, score the paper at 2.75", 5.5", 8.25" and 11". Turn the paper; score at 4". Next you will cut the paper to create the three flaps: cut the vertical score lines at 2.75", 5.5" and 8.25" just until the score line meets the horizontal score line. Fold and glue the final 1" flap down to create the box. I wanted to further accentuate the whale's tail, so I added two splashes by attaching them to a thin strip of clear overlay and then adhering to the back of the whale. The edges of the flaps were edged with some of the Petaloo Taupe ric rac trim. To the back, I added one of the Petaloo Sea Shell Pins to the top of the sailboat. The box can now be folded flat and inserted into an envelope for mailing! I think these look cute for simply displaying or using as a centerpiece for a birthday party or baby shower...lots of ideas! Hi everyone! 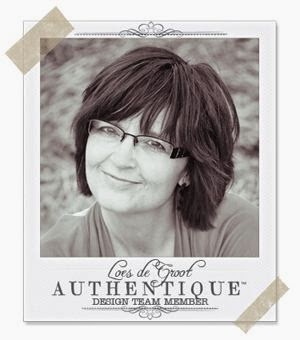 Loes here today to show you how well the "Anchored" collection goes with Petaloo products! This time I decided to make a layout. It's been a long time since I've created a layout! I found this photo of my sons taken in 2010 and wow the time is flying by! I love the deep red and blue colors in this collection. I distressed de papers and make some tear here and there. I cannot get enough of the details stickers! So many possibilities with them! Do you see how great the flowers match? I used a punch for the edge of the paper. The stars are from a Sizzix die. that crab is adorable! cute idea! The layout is gorgeous--i love that the masculine photo still works with the flowers--it is quite lovely--much talent there! OMG...this is the cutest ever!! I am loving this entire line, all the flowers and embellishments. Absolutely gorgeous!!! So Cute and fun, love the mix and colors, this is wonderful. TFS. Love the card in a box. I have plans to make one but haven't done it yet. The nautical theme would make a great box. thanks for having the hop this week. It's been great. All such fun projects. The card in the box is adorable. Oh my, that lay-out is stunning! And the little box is such a cute and clever idea. Beautiful projects today! I must say...I never knew a lobster could be so cute! 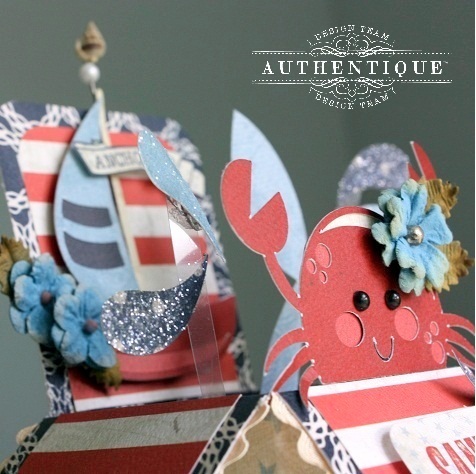 Great mix of papers and embellishments on the layout and the pop up card is adorable--love the crab. Another day of awesome projects! Super cute pop up box, love all the cute details! Cool layout, neat idea for a photo, great dimension and layering! What a blow out of nautical extremes. That box card is awesome. Great layout. Thanks to all the talented artists that showcased Authentique and Petaloo products. I have some great ideas from you folks, now I just need the products to make them happen! Happy Friday and wish me luck. Oh wow! These projects are beyond fabulous! Somehow my first comment was gobbled up so if it shows up somehow that is why. The box is a gift all its own. I love the contrast between the light blue star paper and the bright darker blue and the red crab. It makes the whole project pop. The layout is so wonderful the masculine air of the layout with the distressed edges and the fact that there are flowers all over the page is so interesting It is a really special piece. Oh, the pop up card is just too cute! The layout is wonderful! Wow just shows how some papers are just the perfect papers for some projects! Great DT projects, thanks! oh my, can't decide which one was my favorite, i think the layout, beautiful design's well showcased products!!! Wow oh wow! Both projects are amazing! So much detail and texture! Love it! Another great project, this one is really special and looks like it would be a lot of fun. What a pretty pop-up card and layout! I love all of the details and embellishments. Adorable OTPP and the layout is stunning. I've totally fallen for this line! Awesome box, love that cute crab with the flower! Great work. And the layout is wonderful. Love all of the layered papers and the flowers too. Thanks for sharing. What an adorable box card! That crab is too cute! TFS! That bad card is so cute. I can't wait to try to Make one, so adorable. These papers a are so versatile. what a beautiful card/project! Adorable crab in the center! love this card and layout! I've been wanting to make a box card like that! LOve the paper and the card! That is so cute! What a lovely box card, thanks for sharing this amazing idea! I really like this card! Thanks for sharing. 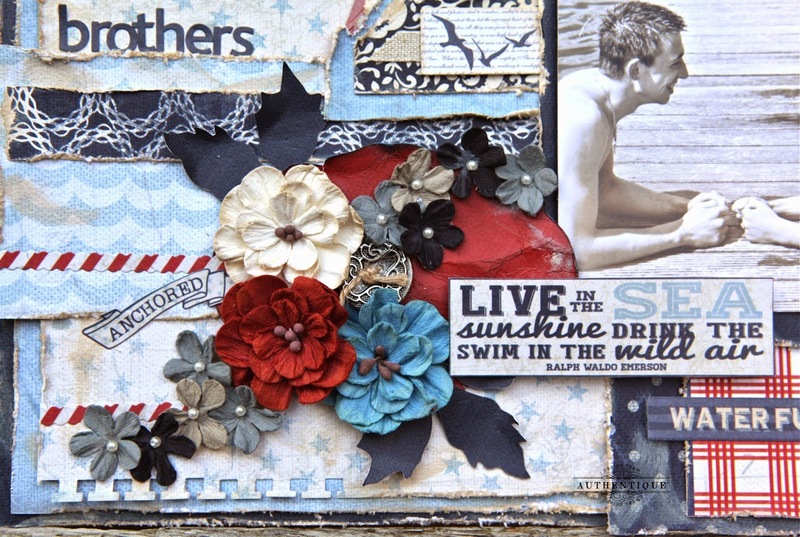 GREAT photo and GORGEOUS layout Loes - LOVE all your pretty layers, colours, textures and flowers!!! THANK YOU for the fabulous inspiration!!! OMG!!! Absolutely love this Americana paper. Can't decide which project I like more?!?! These projects are gorgeous!! Thanks for sharing your art! Oh heck yeah ... I'm lovin' everything here. The products and the projects are fabulous. Just LoVe everything I've seen these past days. Such talented people! Thanks for the chance to win this breezy cool paper. Lve all the cool and very talented projects. Great projects with such awesome paper. Thank you for great week of beautiful projects. wow! 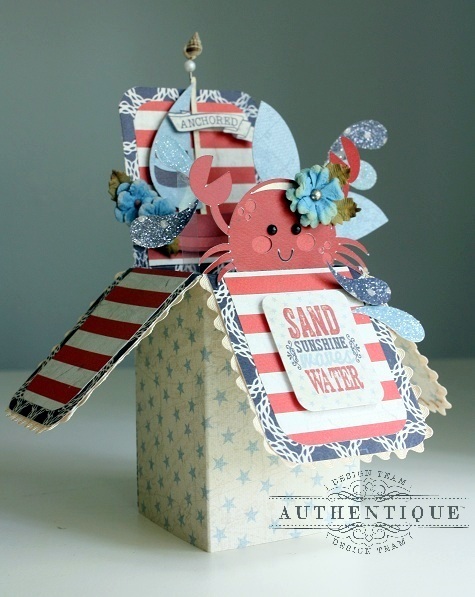 I've always LOVED beach-theme layouts and projects and these are no exception! I can't wait for the Summer - nothing like a good nice long walk on the ocean shore with the man i love. I'm lucky to live on the coast! :) Thanks for the inspiration! So cute! , :-) love it! I love the "Brothers" layout. Especially the fact it uses flowers, yet still maintains a masculine feel through the colour scheme and use of "grunge" elements such as tearing and distressing. Great work! 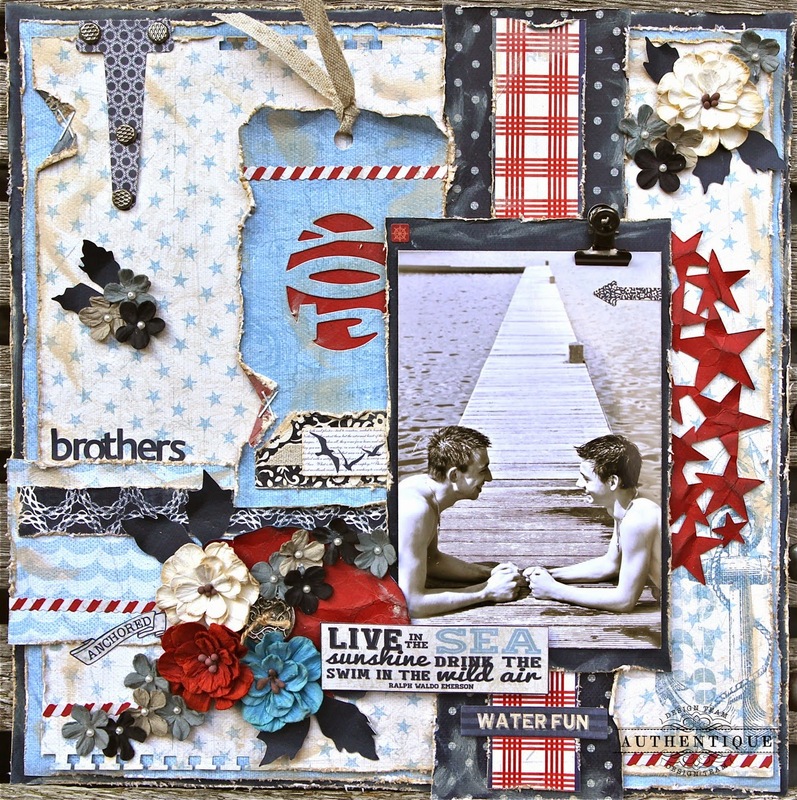 wonderful project - the "brothers" layout is terrific (really like the artist's style and use of the products!) - but, OH THAT CARD! Pop up cards are always fun and this is one of the best ones I've seen. And this collection of papers works perfectly with the idea! Great job, ladies! This nautical collection is terrific!!!!!!! 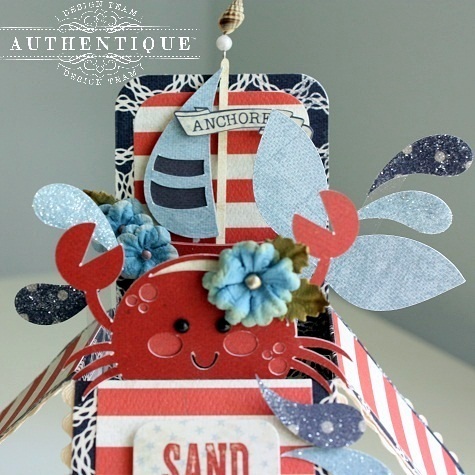 Love the nautical theme.....the card is super cute!!! All these projects just scream SUMMER to me. I love how you have combined all the elements to make such divine projects. Oh, my, what a gorgeous nautical collection! I NEED this! Thank you for the chance to bring it home! All of the blog posts have wonderful inspiration and such a variety of projects from the same paper collection. I'd love to win! enjoyable Hop this past week. Thank you. Loved the projects on the Petaloo blog and here too! That crab is too stinkin cute. Ok, seriously, when I'm crabby--no one thinks it is cute--like that little guy. The papers in this collection are great. I like the cover that looks like denim with the flowers. Oh how I LOVE YOU!! With all this Authentique & Petaloo! With all this red, white & blue! Amazing projects made from fabulous products! I'm sorry to see the Petaloo/Authentique blog hop end! I've seen so many beautiful creations - and been inspired by quite a few of the artists. Thanks for having such a terrific hop - and for the opportunity to win such a generous prize! This has been a fun week with two products that just go together so well! That pop up card is great looking and so creative. That little crab is so cute! 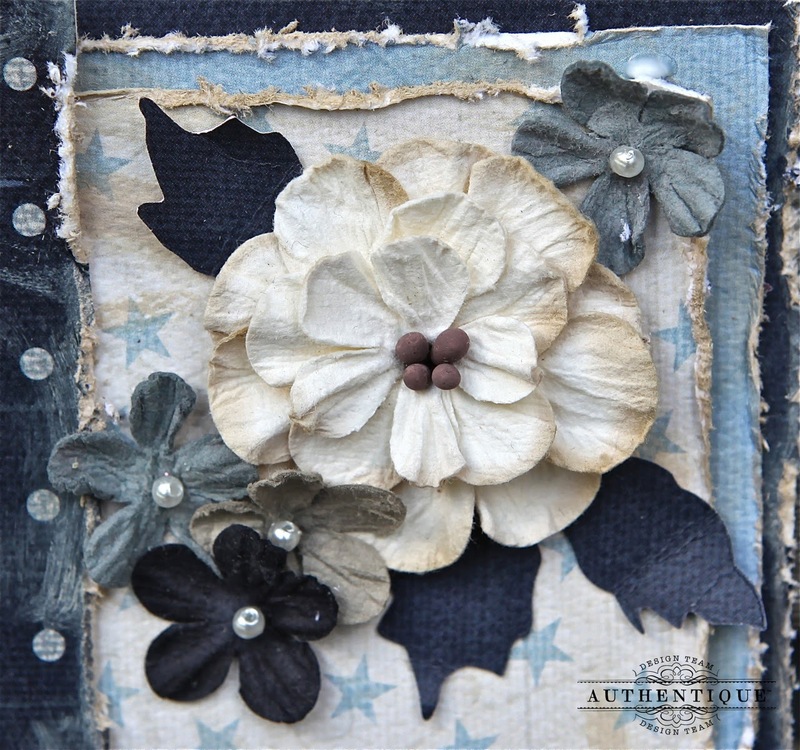 I love the roughed up edges on the layout, the flower groupings and the way the papers are layered up. Very nice. Another two wonderful projects. The pop-up card is just so cute - love the creativity. The layout is just fabulous - despite all the other beyond the page ideas, I am always drawn to layouts because that's primarily what I do as a scrapbooker. Love the distressing, perfect "boy" layout. I loved your project but your layout is simply divine! I have 2 boys and love the masculine touches even using flowers! Great job!